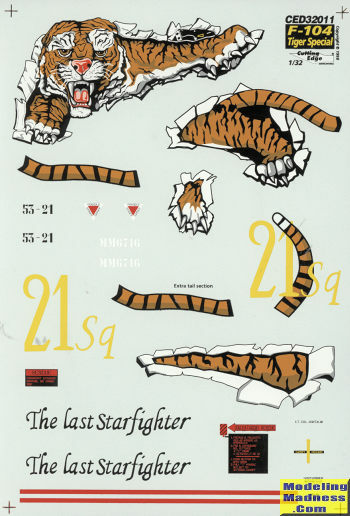 This early Cutting Edge sheet is for one of the more flamboyant Tiger Meet schemes. This one is from the 21st Gruppo, 53rd Stormo and the 1996 event. 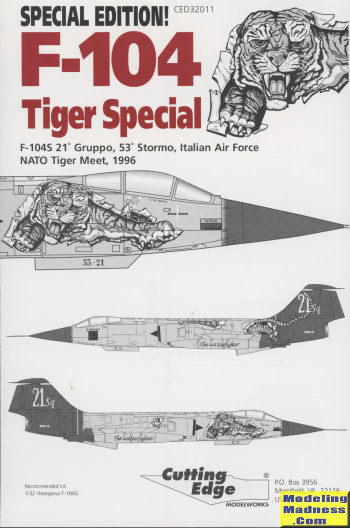 This may have been the first scheme to depict the tiger tearing its way out of the airframe, a theme that has been repeated a few times since. Painting this one is fairly straight-forward as the front is silver with the tail and back of the tip tanks in a dark blue. There are a lot of photos on the Internet if you wish more detail, but the instructions do a good job of providing information on this. The recommended kit is the fairly old Hasegawa 1/32 F-104G. While it doesn't have some of the features of the S model it is close enough for most folks if they add the ventral strakes of the type. I would have thought that CE would have provided a template for these, but they did not so you'll have to wing it using plastic card. Still worth picking up if you find it.